Candy corn, costumed kids, ghouls, goblins, and scary stories. The traditions of the American (commercialized) Halloween are good for a few laughs and scares, but this time of year is a great example of how embracing our own mortality can be a celebration of life. Dia de los Muertos (Day of the Dead) is a traditional holiday, originating from Latin America spanning Halloween, All Saints Day and All Souls Day. 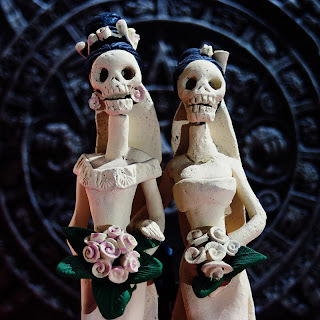 The most well-known celebrations of Dia de los Muertos originate from Mexico where whimsical artistic expressions of skeletons help people remember and commemorate their loved ones. It originated with the indigenous cultures of Mexico (Aztec, Olmec, Maya, etc) and was later interlaced with Catholic themes as those two cultures merged in the past few centuries. With a superficial glance, celebrating and honoring the dead may seem morbid or perverse, especially to those who may see death as a taboo subject, only to be talked about when necessary. 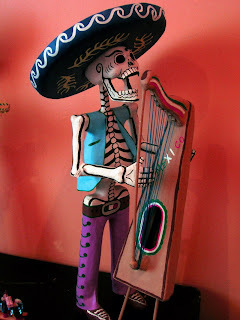 But Dia de los Muertos helps break the somber tone with various traditions that I wanted to share with you here. This is a great theme to bring up in palliative care as a teaching point or in counseling and working with patients and families in how to embrace mortality as a celebration of life. Dia de los Muertos is a time to go to cemeteries and bring gifts to deceased loved ones. Toys for children or flowers, candy, food and even alcohol for adults. There people often eat and picnic near those who have already died. In addition altars are made with pictures, candles and other memorabilia celebrating the deceased. 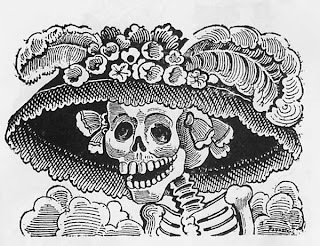 The skull is omnipresent in Dia de los Muertos altars, decorations, and costumes. It is typically drawn in a light hearted way, and some art portrays skeletons in colorful, comical situations. The symbol of a skull is also highlighted in food preparation with sugar skulls, cakes, and other foods decorated with them. It is interesting how the skull has recently been raised in teen pop culture and clothing in the past two years, often in a ironic and funny way. 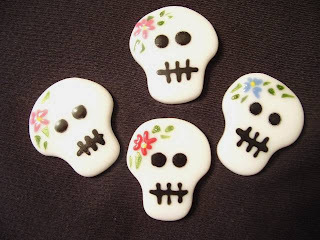 The above mentioned sugar skulls are a popular treat. They are for eating, not just for decorations. Pan de muerto (bread of the dead) is another popular food made during this celebration. It would be nice to see some of these traditions given some attention in the United States outside of the Southwest. Death does not have to be solely perceived as the inability to cure. The traditions that help us preserve the memory of deceased loved ones are important. Hospice and palliative care teams could engage their local communities to highlight these traditions. It might make us all a little less fearful of death and more appreciative of the short lives we have. Here is one of the better of many YouTube videos showing the festivities in Mexico.